2-3 caps in a bath. Water, Sodium Laureth Sulfate, Cocamide DEA, Eucalyptus Globulus Oil, Polysorbate-20, Sodium Chloride, Hydrolozyed Wheat Gluten, Citric Acid, Potassium Sorbate, Sodium Benzoate, Ethylparaben. This bath is great. 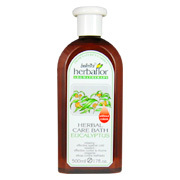 It is not only herbal but it is also great smelling and really soothes the bath. Anonymous "Some of the best"
This bath is one of the best that I have ever used. Great to use after a long days work and just go home to a nice warm bath and put some of this in. Eucalyptus Herbal Bath is shipped in a discrete, unmarked package. Orders are processed immediately and usually take about 3 to 5 working days to be received. Any information received is used only for order processing and shipping purposes. Your information, such as e-mail address, will never be disclosed to a third party.